I was at the grocery store and a local bread company was giving away samples for their organic, non-GMO bread. While, I love those chocolate samples, I was not in the mood to try out some bread but they called out to me and asked me if I wanted a sample. I felt odd just walking away so I took a sample and when I tasted it, I immediately could tell the difference. I read the ingredient list and there were like 6-7 ingredients that were used in the making of this bread and ALL that you could recognize. We try to follow this rule while buying ‘most’ of the grocery products – if we recognize the ingredients we buy it. There were a few exceptions to the rule when it came to bread and croissant and sometimes store-bought birthday cakes but for the most part, we like to stick to that rule. Anyways, coming back to the bread, once you taste the good stuff, you don’t want to go back. 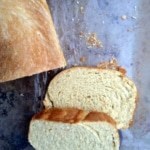 So, while I bought the bread, I decided to bake my own as well and here’s the result of my experiment. Get the dough ready - Add 5 and a 1/2 cups of flour, sugar, salt, yeast and butter in a mixer bowl. Attach the dough hook to the mixer. Mix the ingredients at the lowest speed (2 in case you are using stand-in mixer) possible for about 20 seconds. Add the warm water and continue to mix for about 1-1/2 minutes longer. The mixture will be sticky at this point.Continue to run the mixer at the lowest speed and add the remaining flour, 1/2 cup at a time and mix until the dough is no longer sticky (~ 2 minutes). Knead with either your hand or in the mixer for 3 more minutes until the dough is smooth and elastic. Let it rise - Cover the dough with plastic wrap and a towel. Let it rest for about 25-30 minutes till it doubles in size. 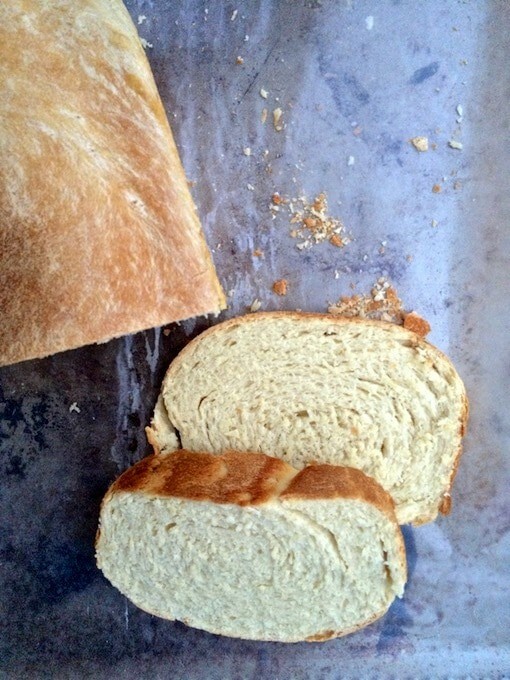 Shape it into a loaf - Divide the dough into half. Roll each half into a rectangle on a lightly floured surface using a rolling pin. Start at the short end and start rolling the dough tightly into a log shaped loaf. Pinch to seal the seam and place the dough seam side down in a well greased loaf pan. Repeat the process for the other half of the dough. Brush each loaf with oil and cover it with a plastic wrap. Let it rest for 30 minutes until the dough has risen 1 inch above pans. Bake it - Preheat the oven at 400 degrees F. Bake at 400F for 35 to 40 minutes. Remove the pans immediately and cool on wire racks. Hi , i have a query . Was the butter you used unsalted ? secondly i have a magic bullet. If i use that instead how do I mixi it? Hi, Rajni – If you don’t have a stand in mixer, I would recommend you knead by hand. Hope this helps.